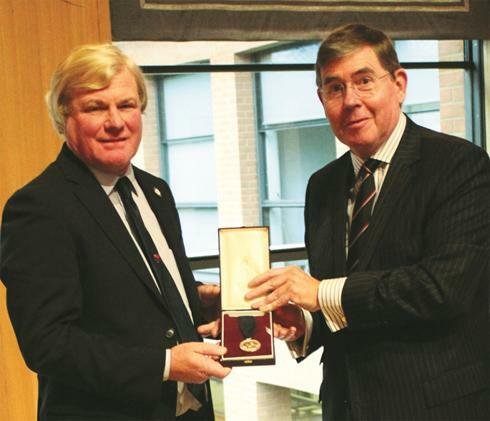 Congratulations to Neil Atkinson, Marine Surveyor with the Maritime & Coastguard Agency and Chairman of our Southern Port Welfare Committee who was recently awarded the Marine Society’s Thomas Gray Memorial Medal. The Thomas Gray Memorial Trust was established in 1925 in memory of Thomas Gray, a senior surveyor for the Board of Trade, who wanted to improve the professionalism of seafarers in the latter half of the 19th century. The Thomas Gray Memorial Medal is awarded to maritime professionals “in recognition of exceptional deeds of merit at sea and includes services to seafarers in the broadest sense. These deeds can be related to any aspect of seafaring, including saving of lives, the wellbeing of seafarers and any exceptional deeds related to the business of seafaring”. A hardworking and resolute advocate of ensuring the welfare and wellbeing of seafarers, Neil Atkinson has been instrumental in driving forward the Maritime Labour Convention 2006 (often referred to as the “Seafarers Bill of Rights”) and raising awareness of the new legislation across the Port Welfare Committees and the wider maritime community. Neil was presented with the Thomas Gray Memorial Medal at the Marine Society’s ninth Annual Court at Haberdashers' Hall in London on 18 October 2013 where guest speakers included Admiral Sir Mark Stanhope GCB KBE and the Shipping Minister, the Rt Hon Stephen Hammond MP. The Board’s Chairman, Bob Jones, was also present at the presentation ceremony. Mr Jones commended the hard work and dedication of Neil Atkinson and the Maritime Coastguard Agency in seeking to improve the welfare and wellbeing of seafarers. This year’s Royal British Legion’s annual Festival of Remembrance at the Royal Albert Hall on Saturday finally recognised the huge sacrifice that the Merchant Navy made during the Second World War. Winston Churchill himself said the Battle of the Atlantic was the longest battle of the war and the one whose outcome he most feared. During those 6 long years, more than 30,000 Merchant Seafarers lost their lives, a greater percentage than any of the other services. During the Festival, 6 Merchant Navy veterans of the Battle gave their moving tribute to their lost comrades and received a standing ovation from all those within the hall. An interview was also shown of one of the veterans, Donald Staddon recounting the moment he was torpedoed. The Board funds the travel and hotel costs for the veterans to attend the Festival each year which is seen as an opportunity to highlight to the general public and armed services, the significance of the contribution made by the Merchant Navy and fishing fleets during times of conflict. This year, as in previous years, with the agreement of The Royal British Legion, the Board also sponsored 6 cadets from Warsash Maritime Academy to accompany the veterans. This year the Red Ensign was paraded with the legions standards by the Merchant Navy Association’s standard bearer, Tony Sullivan. A big thank you to all our veterans and cadets who did a brilliant job representing the Merchant Navy at the Festival on Saturday night. On a recent visit to Gibraltar, the Board's Chief Executive, Capt. David Parsons attended the annual Seafarers Service at the Cathedral folllowed by a reception hosted by the Mayor of Gibraltar. Capt. Parsons reminded those present at the reception that Gibraltar had the MNWB's newest Port Welfare Committee, which was established in 2005. In the subsequent eight years the committee had grown from strength to strength and was now extremely proactive in supporting the welfare services to seafarers visiting the "Rock". The PWC helped Gibraltar, like the UK, comply with the requirements laid down in the International Labour Organisation's Maritime Labour Convention (2006), which had been ratified by both states in August. Capt. Parsons went on to say that his first of many visits to the Rock had been in 1964 and he had always been struck by the welcome and hospitality given to seafarers by the people of Gibraltar. He particularly thanked the PWC members, under the chairmanship of Capt. James Ferro MBE MNM, for all their hard work and support and the Mayor for his kind hospitality. 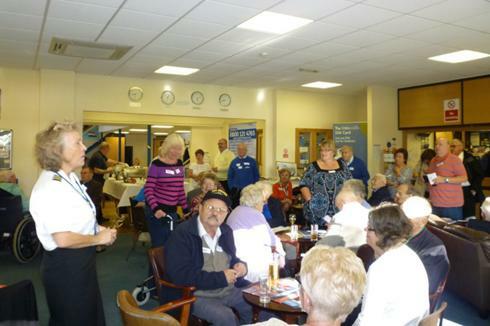 Sally Oliver, Welfare Support Manager and Sharon Coveney, Port Welfare C ommittee Manager were delighted to be invited to this nautical lunchtime gathering, which was hosted by Carers Together, Southampton earlier this week. The event was extremely successful and very well attended by a selection of seafarers and their carers, from MN, RN, RFA and RM backgrounds. People were encouraged to chat about their experiences at sea, share any photos and mementoes that they brought with them which was followed by a fish and chip lunch. The day concluded with Sally and Sharon speaking about the welfare services that the Board is able to offer. R. A. Covey, Senior Steward, RRS ERNEST SHACKLETON (British Antarctic Survey), for services to merchant shipping and the Mission to Seafarers. Captain J. L. Drewitt, Harbourmaster, PD Teesport, for services to seafarers’ welfare and maritime charities. Captain A. Hashmi, Deputy Captain, QUEEN VICTORIA (Cunard Line Ltd), for services to the maritime industry, especially crew welfare. Captain A. L. Le Goubin FNI, Mooring Master, Ship To Ship, for services to the Nautical Institute and the maritime industry. Commander C. G. Loughran RD RNR, Consultant Marine Surveyor, MCA, for services to the Maritime & Coastguard Agency and the Fishing Industry Safety Group. Captain I. McNaught, Deputy Master of Trinity House, for services to the Corporation of Trinity House and the maritime industry. Captain N. J. Palmer OBE, Chairman, Maritime Skills Alliance, for services to seafarers training and the maritime industry. M. W. Parrott, Managing Director, The Maritime Group (Europe) Ltd, for services to ship management and shipbroking. Captain G. Preston, Master, BRITISH OSPREY, BP Maritime Services Singapore Pte Ltd, in recognition of humanitarian response and seamanship skills when rescuing a boat laden with refugees in the Indian Ocean on 5th June 2013. F. S. Prowse, Director, Fleet Personnel, Cunard Line Ltd, for services to the support and welfare of shipboard personnel. Captain N. Pryke, Elder Brother of Trinity House, Chairman of Great Yarmouth Port Authority, for services to the maritime industry, Trinity House, pilotage and Felixstowe Seafarers Centre. I. W. Stockbridge, for services to merchant naval history, especially British World War II ship casualties. Captain R. M. Woodman FNI, Elder Brother of Trinity House, for services to Trinity House and British merchant naval history. The award ceremony will take place at Trinity House, London on the 25th November 2013. Service of Thanksgiving for the 25th Anniversary of The Flying Angel Centre, Belfast, St. Anne's Cathedral. Evensong with New Sec-Gen. Mission To Seafarers, Canon Andrew Wright, preaching. Replaces annual Harvest Thanksgiving held in The Flying Angel Centre, Belfast. This service will incorporate a memorial for the 60th anniversary of the Loss of the Princess Victoria on her way to Larne. Starring Tom Hanks in a story of a hijacking at sea and based on a true story. A private showing in aid of The Mission to Seafarers. Tickets £20 pp by contacting Doreen 02890 751131. The tickets can be collected from the Flying Angel Centre, Belfast or picked up on the night. Sponsored by Hamilton Shipping. Refreshments served. An opportunity for the public, neighbours & supporters to see the revamped lounge & new artistic feature celebrating 25 years in the present Centre, Prince's Dock St (Sailortown) Belfast BT1 3AA (Close to Cityside Shopping Centre & beside the main gate to Port of Belfast). 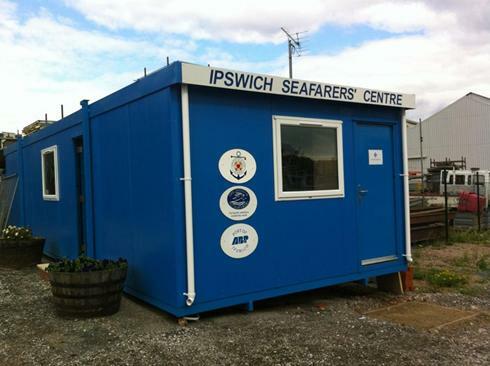 This coming Thursday, 26th September 2013, Hamil Clarke, Mayor of Ipswich will officially launch a brand-new seafarers’ cabin at Ipswich Dock in front of an invited audience of around sixty people. The party will then retire for a reception on board the Thames sailing barge Victor moored nearby on Eagle Wharf. The event has been organised by David Thurston, Chairman of the Felixstowe & Haven Ports Seafarer Service (FHPSS), a stand-alone charity (no.272077). From its Centre at the Port of Felixstowe, the charity operates two satellites – one at Ipswich, the other at Harwich. Two Chaplains are based at the Felixstowe Centre but also visit ships in the two satellites – Sister Marian Davey for the Apostleship of the Sea (AOS/Stella Maris) & Rev Simon Davies of the Mission to Seafarers (MTS/Flying Angel). The new cabin has been provided by the Environment Agency. Their project manager, Andrew Usborne, has been working with Comer Mead of Royal Haskoning DHV and Ashley Tate of Jacksons, as part of the advance works to build the Ipswich Tidal Barrier. The Cabin is located on a site kindly lent by Associated British Ports (ABP). Jerry Coleman, Harbour Master at the Port of Ipswich along with his team, not least Richard Lungley, has been closely involved in the installation and fitting-out of the Cabin which features a lounge area and a chapel along with telephone and Internet facilities. 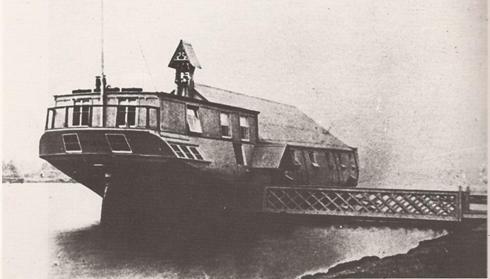 There has been a permanent facility of some kind or another for seafarers in Ips wich since 2002 but recent research has revealed that there was in fact a seafarers’ centre (or chapel in this case) in Ipswich back in the 1870’s in the form of an old war ship!! To read more about this fascinating piece of maritime history please download the full press release here. As many of you will know the United Kingdom ratified the International Labour Organisation’s Maritime Labour Convention (2006) on 7th August 2013. The Merchant Navy Welfare Board greatly welcomed the adoption of the Convention as it formally recognises the human rights of seafarers around the World. Significantly Part 4.4 fully acknowledges the importance of welfare boards and port welfare provision, much of which has been based on the operational model established by the MNWB among its Constituent members and Port Welfare Committees. On 12th September 2013, at the joint meeting of the UK & Gibraltar Port Welfare Committees in Southampton, Neil Atkinson of the Maritime & Coastguard Agency announced the promulgation of Marine Guidance Note - MGN 486 (M)*. This reinforces the Board’s key role, that of supporting organisations providing welfare to merchant seafarers and their dependents in the UK and Gibraltar. Mr Bob Jones, Chairman of MNWB, welcomed MGN 486 (M), which formally acknowledges and underpins the Board’s lead role of supporting the provision of quality welfare services for seafarers and their dependants, working in partnership with its constituent members and Port Welfare Committees. A big thank you must go to Neil, a Marine Surveryor at the MCA and Chairman of our Southern Port Welfare Committee for his efforts in getting MGN 486 (M) published. To download a copy of MGN 486 (M) please click here. * Note Marine Guidance Notes (MGNs) give guidance and strong recommendations about best practice to industry on interpretation of law and general safety advice. The Board are very pleased to report that today, Merchant Navy Day, 3rd September 2013, Mr Stephen Hammond MP, Parliamentary Under Secretary of State for Transport, announced that Her Majesty The Queen has graciously awarded a medal for the Merchant Navy. It is understood that these medals will be awarded annually both in the New Year’s Honours’ and Queen’s Birthday Honours’ lists and granted an Order of Wear. "There has long been an acknowledgment amongst the maritime community that the importance of the Merchant Navy has not been recognised at a national level. We are hugely honoured that Her Majesty the Queen has granted the Merchant Navy its own national award and in doing so reinforcing the importance of the Merchant Navy in the lives of all us, not just in the past but going forward as well. Once more details are known these will be added to both the MNWB’s and Merchant Navy Medal websites. The UK does not ratify Conventions until legislation is prepared to ensure that it is able to meet its international obligations. 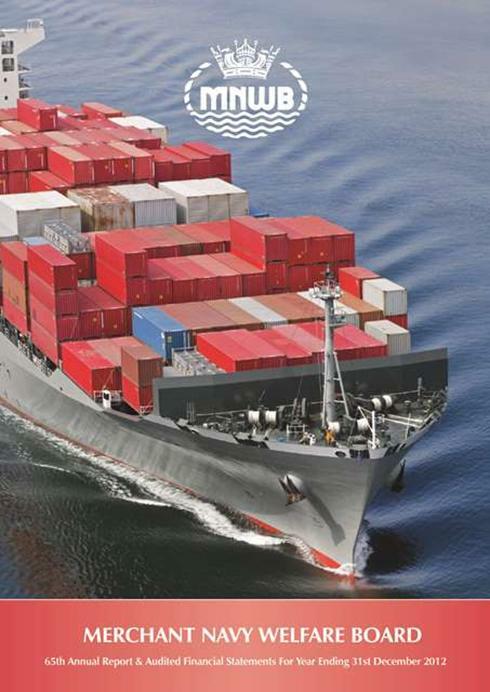 As a result ratification has been a lengthy process involving a number of Government departments alongside extensive contributions from the UK Chamber of Shipping, Nautilus International, RMT and other stakeholders. Ratification is a formal undertaking by a country to be bound by the terms of the Convention. There are 1,383 vessels, totalling 16.57 million gross tonnes, on the UK register and these employ around 89,000 seafarers. More than 24,100 UK nationals work as seafarers and adoption has been extended to include the Isle of Man and Gibraltar. "I am pleased to adopt this convention. This will ensure that there are globally agreed standards for seafarers and their right to decent working conditions. It will also provide clarity of regulatory approach and remove obstacles to regional trade. "It also ensures a level playing field for the UK merchant fleet because the Convention will require ships registered in other states to meet internationally agreed standards." The Merchant Navy Welfare Board greatly welcomes this adoption. Part 4.4 of the convention recognises the importance of establishing welfare boards and port welfare provision. Much of this part has been based on the role model of MNWB, its port welfare committees and the work of its constituent members. They would love to hear your stories and speak to you. Any Battle of the Atlantic stories would be wonderful to hear too. If you can help, please contact Harriet at Golden Goose PR either via 07787 446155 or via harriet@goldengoosepr.com. 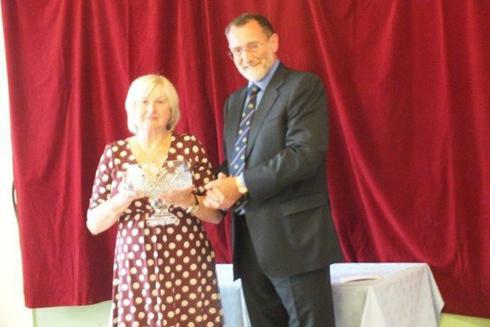 There were two recepients of the MNWB Services to Seafarers Welfare Award this year - Elaine Elliott and Frank Welsh. Elaine is the manager of the Fowey Seafarers’ Centre and has worked for the Mission for over 25 years. Elaine is tireless in her commitment to the Mission’s work often going above and beyond the call of duty. She regularly organises fundraising events as well as undertaking ship visits, transporting seafarers to church and delivering gifts to seafarers at Christmas, much of this down in her own time. Elaine is well known for referring to visiting seafarers as ‘her boys’! Congratulations Elaine - you deserve it! 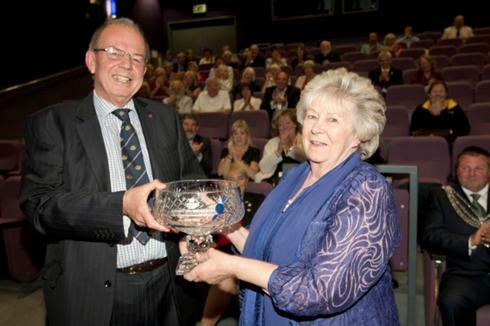 Pictured is Kathleen Welsh, wife of the late Frank Welsh, receiving the MNWB Services to SeafarersWelfare Award 2013 on his behalf from MNWB Chairman, Bob Jones. Frank was awarded the award posthumously for his long term devotion to the sea and in particular seafarer’s welfare. He was a long term trustee of our own Board and sat on our Southern Port Welfare Committee. It was the Merchant Seamen’s War Memorial Society (now known as Care Ashore) who nominated Frank for the award. He was a trustee for them for many years where he provided much needed advice and support to the Board, individual seafarers and their families. Frank will be sadly missed. Care Ashore (formerly The Merchant Seaman's War Memorial Society) held an open day on Sunday 30th June to launch its new working name. Founded in 1920, the charity provides assistance to seafarers and provides both sheltered housing with support, and holidays. Anyone who has served in the Merchant and Royal Navies, plus the fishing fleets may apply for accommodation or a holiday. The change in name is part of a wider effort by the charity to increase awareness of the support and assistance they can offer to seafarers such as those from the Merchant and Royal Navies, fishing fleets and Royal Marines. Guests were kept fed and watered throughout what was a lovely sunny afternoon and left fully relaxed and with a lot more knowledge of the charity and its objectives. For more information visit their website www.careashore.org or telephone 01403 752555. 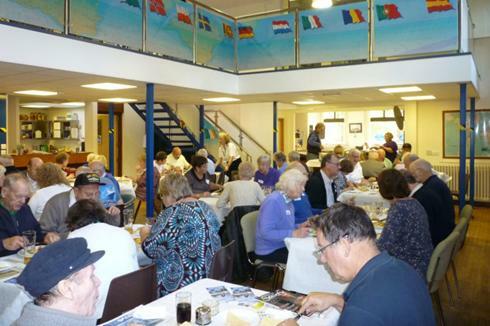 Southampton Seafarers’ Centre recently hosted a working breakfast for maritime and non-maritime organisations from across Hampshire and further afield. 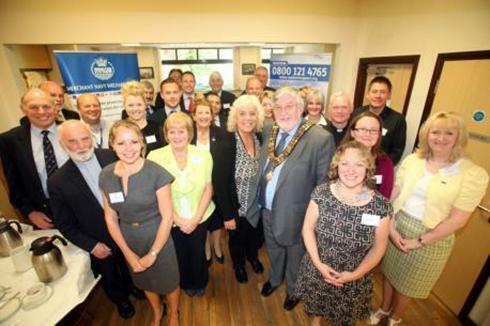 The event was organised by the Board’s Southern Port Welfare Committee (PWC) and was funded via an MNWB grant. The event was held during Seafarers Awareness Week, the annual campaign designed to raise awareness of Britain’s dependence on seafarers. Organisations who attended the breakfast included Hampshire Police Marine Unit, South Central Ambulance Service, Princess Cruises and Seamariner. The new Mayor of Southampton, Cllr Ivan White and his wife Mary also attended. During the breakfast, guests were given a brief outline by Captain David Parsons, Chief Executive of the MNWB on the role of the Board, the Southern Port Welfare Committee and Seafarers Awareness Week. Reverend Andrew Huckett, the Southampton Mission to Seafarers Port Chaplain then spoke about the role of the Southampton Seafarers’ Centre followed by Sgt Tony Birr of the Hampshire Police Marine Unit who gave a brief talk on the role of the unit. Our Annual Report for 2012 has just been printed. To download a copy please click here. To see previous years reports please click here. The Secretary of State for Foreign and Commonwealth Affairs (Mr William Hague): I am pleased to announce that formal approval has been given to a recommendation for an exception to the rules on the acceptance of foreign awards to allow eligible British nationals to accept and wear the Russian Ushakov Medal. In May 2012 the Russian Government requested permission to award the Ushakov Medal to British veterans of the Arctic Convoys. Under the current rules on the acceptance of foreign awards, permission could not be given for the medal to be accepted as more than five years had passed since the events in question and there had already been British medallic recognition for this service. Although under these rules permission could not be given for the Ushakov Medal to be accepted, Her Majesty’s Government have always been appreciative of the Russian Government’s wish to honour these brave men. In light of that appreciation of this service, a recommendation was therefore made to exceptionally allow the Ushakov Medal to be accepted and worn. President Putin presented the first medals during his visit to London on 16 June 2013. Applications and eligibility for the Ushakov Medal will be a matter for the Russian authorities. Events begin today that will celebrate 200 years of history of the port of Ardglass in Northern Ireland. 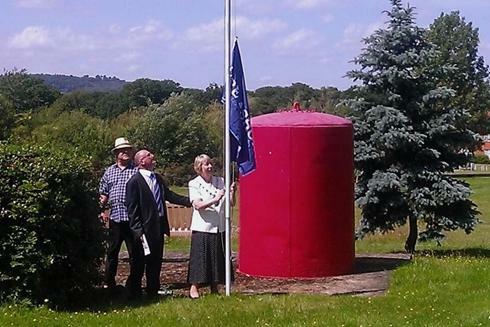 The events, partially sponsored by the MNWB are part of Seafarers Awareness Week. The old Spar shop on the harbour in Ardglass has been transformed into a centre to celebrate Ardglass’s maritime history. NIFHA, the local Harbour Authority have been instrumental in bringing together many local people to help organise and run the event, including local artists, photographers, model makers and historians. As well as a marine touch tank, bird watching, maritime talks and displays of photos and paintings, there will be demonstrations by the local RNLI and rescue helicopter. Any money raised from the event will go to the Fishermen’s Mission and RNLI. Captain Nicholas Bates, a former master of the QE2, who is from Ardglass will give talks on his life at sea. This will take place in the Golf Club on Friday 21st June and again in the main venue (old Spar shop) on Saturday 22nd June. For further information on the events please contact the Harbour Master, John Smyth on 02844 841891 or 07990 648274 or email john.smyth@nifha.co.uk. Facebook: Ardglass200. Please click here to download a copy of the events timetable. Northern Ireland PWC members and volunteers from Mission to Seafarers, Seaman’s Christian Friend Society and other organisations manned a small marquee at the Belfast Maritime Festival held during the May Bank Holiday (25th to 27th May 2013). The Titanic Quarter in Belfast was the setting for the festival celebrating the city’s unique maritime heritage over the May bank holiday weekend. 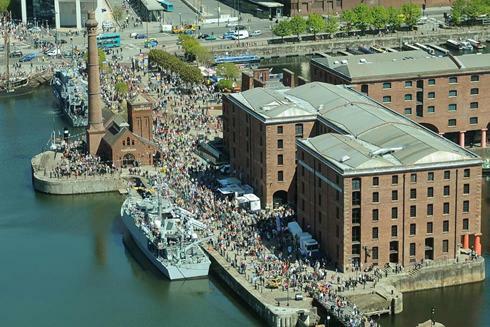 The festival included a fleet of tall ships and a series of Titanic tours. 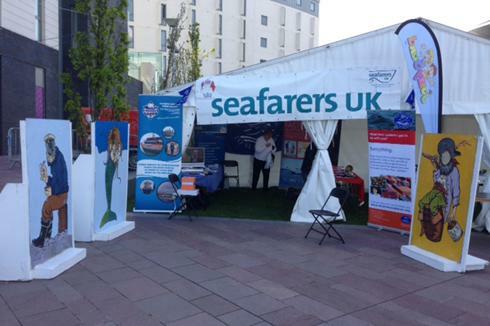 The marquee proved popular with much promotional material being distributed by the various organisations represented and even some donations were received in the Seafarers UK box. The Merchant Navy Welfare Board was represented by its Chief Executive Captain David Parsons, ably assisted by his wife Nancy, at the commemorative events for the 70th Anniversary of the Battle of the Atlantic in Liverpool between the 25th and 27th May. As well as attending many of the ceremonial events, the Board shared space in the Maritime Charities marquee with Seafarers UK, the Merchant Navy Association and Care Ashore (formerly Springbok Homes) – nearby was Nautilus Welfare Fund. The events were very well attended, especially on the Saturday and Sunday when the weather was glorious. The marquee attracted a great deal of interest from the general public of all ages and many of the veterans were made very welcome. 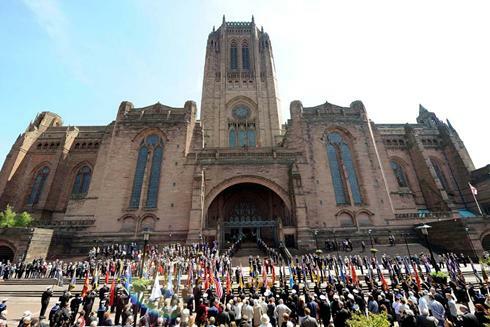 The very moving service at Liverpool’s Anglican Cathedral, attended by HRH The Princess Royal, was broadcast by the BBC on their national network. There is no doubt that these events have done much to remind the public not only of the history and sacrifices made, but also of the importance to these islands of the Merchant and Royal Navies. 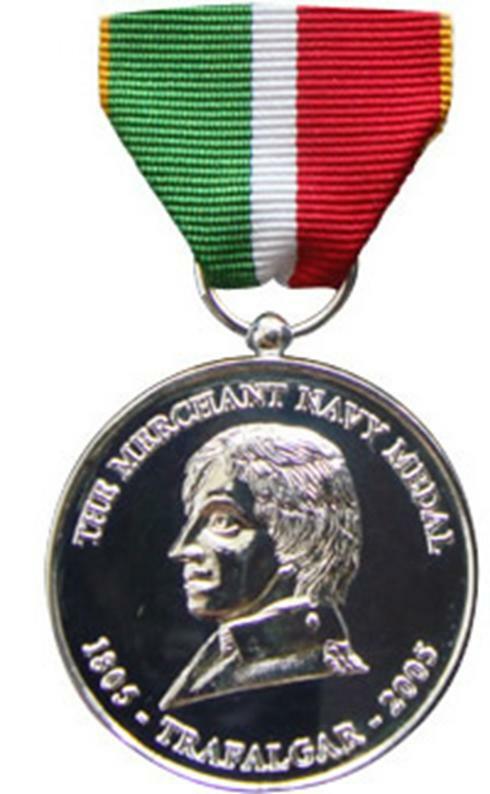 The Merchant Navy Medal, established in 2005, is a prestigious annual award recognising acts of courage afloat or meritorious service by persons from the United Kingdom, or British Overseas Dependent Territories, within the Merchant Navy or fishing fleet. 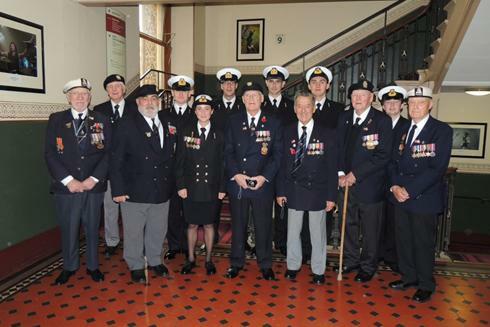 An unlimited number of Merchant Navy medals can be awarded annually for acts of courage afloat. Up to a further 20 people are short-listed each year for meritorious service awards. The closing date for this year’s nominations is the 30th June 2013. To find out more about the medal and how to nominate someone please go to www.merchantnavymedal.org. The Board has just become aware of a new scheme offering discounts at major high street companies that will be of benefit to Merchant Navy Veterans. The MOD launched the new Defence Discount Service in 2012, as part of the Armed Forces Covenant, in recognition of service in the Armed Forces. The Defence Discount Service is open to members of the Armed Forces community including serving and reserves personnel and veterans. The Board has double checked with the Defence Discount Service and they confirm that Merchant Navy Veterans who hold the Merchant Navy Veterans Badge and RFA veterans are eligible to use the service. The service offers online discounts on among other things: cars, laptops, supermarket shopping and holidays. Veterans can also apply for the Defence Privilege Card which is accepted in-store in participating companies. The card costs £4.99 and is valid for 5 years. The list of participating companies is expanding every day and includes among others Vodafone, KFC, Vue Cinemas and a number of major supermarkets. For further information on the service, please go to the Defence Discount Service website www.defencediscountservice.co.uk. New members need to register on the website and once completed gives free access to any available discounts and offers. Once registered, veterans can also apply for the Defence Privilege Card. A postal application is also available to download from the website. The Defence Discount Service can be contacted on 01509 233446 if you have any questions. To be eligible for the Merchant Navy Veterans Badge, you should have served on a vessel at a time when it was operated to facilitate military operations by UK Armed Forces. For further information on the badge and on how to apply please click here. 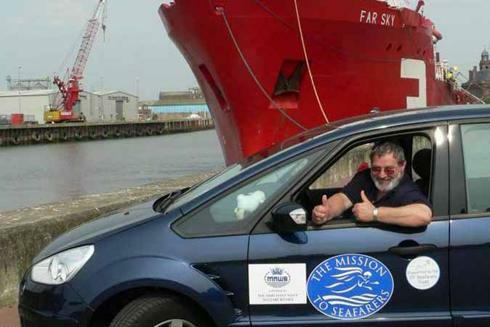 Mission to Seafarers’ Port Chaplain and Chairman of the Board’s East Anglia Port Welfare Committee, Revd. Peter Paine was very pleased to announce this week that Great Yarmouth would shortly have its very own Seafarers’ Centre. Working together with the Great Yarmouth Port Co mpany and Great Yarmouth Borough Council, suitable facilities have been found to enable the establishment of a new Centre on South Quay. Located close to the Town Centre, the facility will offer a space for seafarers' to relax away from their vessel along with access to the internet with advice and support from chaplains and volunteers where required. Eliza O'Toole, Vice Chair of Great Yarmouth Port Company said "Having supported the service provided by the Port Chaplaincy financially since taking over the port, we are delighted to expand our support to establish a home for the Great Yarmouth Seafarers’ Centre within the port estate which will provide a valuable service supporting the crews of visiting vessels. We will be providing accommodation and facilities at no cost to the Mission as part of our contribution to the port community as a whole. We wish it every success and look forward to a close and on-going relationship with the Centre." Leader of Great Yarmouth Borough Council, Cllr Trevor Wainwright concurred saying 'Working closely with Great Yarmouth Port Company, we have been able to locate suitable premises for the Seafarers’ Centre which increases the service offering of the Port and indeed the town. Further strengthening ties between the Port and the port community is something that I know the Port has been keen to do for some time and this was a great opportunity for us to put our heads together to achieve this". Revd. Peter Paine said "I would like to thank Great Yarmouth Port Company for their generous support in providing the facility on South Quay and we look forward to working with them and the Borough Council to offer visiting vessels a wide range of services' and a welcome into the community at Great Yarmouth. 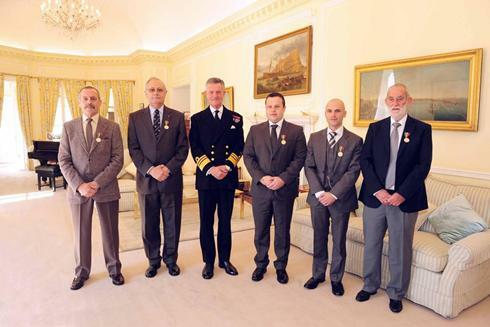 At a very well attended ceremony in Gibraltar five Merchant Navy Medals were presented to local seafarers by The Governor, Vice-Admiral Sir Adrian Johns KCB CBE, at his Residence. Four of these were awarded to the crew of a harbour tug in recognition of Acts of Courage Afloat, whilst another was presented in recognition of Meritorious Service. At the presentation The Governor made reference to this being the first time the medal had been awarded outside the United Kingdom, adding his very personal congratulations to all the recipients. Gibraltar is an increasingly busy port with a reputation for high standards of service and hospitality to visiting seafarers. The Chairman of the Merchant Navy Medal Committee, Captain Matthew Easton, responded with his thanks adding that personnel living and working in the UK and its Crown Colonies were eligible. He went on to say that the medal committee welcomed nominations from both sources adding that the medal was becoming increasingly well-known both inside and outside the maritime sector. On 31 May 2011 at 1530 there was an explosion followed by a fire at the oil reception treatment plant on the North Mole of Gibraltar Port. The fire was so intense that one of the oil tanks collapsed and it took the combined efforts of shore fire appliances and fire fighting tugs, until the following morning, to bring the fire under control. The main tank on fire contained a mix of oil, oil residue and flammables with a flash point below 30C. Berthed alongside the facility was oil slops barge “No 1707”, containing a large quantity of flammable liquid. Tug “Egerton”, which has no fire fighting capability, under the command of Skipper Douglas Pincho with deckhands Wayne & Tommy Penalver and engineer Ernest Lara, was tasked with assisting in moving various vessels away from the vicinity of the fire. The City Fire Brigade on-scene commander considered that the position of “No 1707” was too close to the seat of the fire to allow access to let go the mooring ropes and enable her to be moved to a place of safety. He instructed the tugs to keep clear. By 1730 the fire had become well established with a significant risk of spreading to “No 1707”, which would probably cause it to explode. Skipper Pincho again offered to move it to safety, but was denied permission by the on-scene commander. Mr Pincho then called the Port office, requesting and obtaining their permission to attempt to move the barge. At that time its deck had begun to blister and was too hot to stand on. Mr Pincho called on one of the fire fighting tugs to lay down cooling water down onto the deck and took ”Egerton” alongside. Mr Tommy Penalver and his brother Wayne jumped aboard, secured a line and let go the mooring ropes. They reboarded “Egerton” which then manoeuvred the barge to safe berth. Skipper Pincho and his crew are all very experienced and would have been only too aware that they were placing themselves in a very dangerous situation. They were still prepared to accept the risks to prevent further escalation. Had the fire spread to the barge there is little doubt that an already dangerous incident would have escalated considerably. An explosion on “No 1707” would have resulted in burning oil spreading within the inner harbour and probably elsewhere. 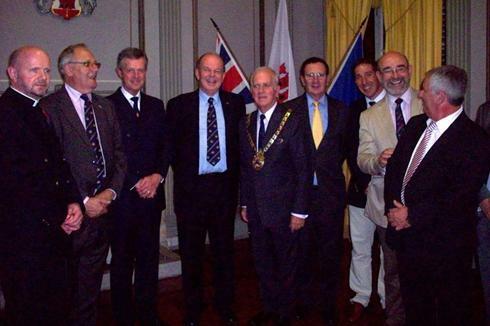 As past Captain of the Port, James Ferro played a significant role in promoting the development of a Port Welfare Committee in Gibraltar, liaising with the Merchant Navy Welfare Board, Government ministers and a wide range of maritime agencies to ensure effective local representation and participation. It was his first-hand knowledge and understanding of seafarers' welfare issues, combined with his experience of working with the maritime community that made him an obvious choice for the appointment of Chairman to the Committee, formally established by the Merchant Navy Welfare Board in 2006 as a welcome extension of its UK PWC network. Tireless in his efforts to develop a strong and effective seafarers' welfare support base in Gibraltar, Captain Ferro was instrumental in the establishment of two much needed and muc h valued Seafarers' Centres, on the North and South Moles. Under his leadership and guidance, the Gibraltar PWC has evolved into a proactive, multi-agency network. This has grown in status and is increasingly recognised as the key maritime partnership in Gibraltar, working to ensure seafarers' welfare needs are effectively met. He has been instrumental in encouraging multicultural representation on the PWC, thus ensuring that the welfare needs of any merchant seafarer, irrespective of faith, nationality or creed, are dealt with, in a respectful and appropriate manner. He is also Secretary of the Mediterranean Mission to Seafarers and Trustee of the Seamen's Welfare Fund. Even in retirement he therefore continues to devote a large part of his life to caring for the welfare and well-being of seafarers in Gibraltar. For further information on the Merchant Navy Medal please visit the medal website. The Battle of the Atlantic was the longest continuous military campaign of World War II and resulted in the loss of some 30-40,000 Merchant Navy personnel and around 5000 ships. The turning point in the campaign for the Allies was May 1943 when German submarine losses became unsustainable. To mark the 70th anniversary of this historic event, the Royal Navy, supported by representatives from the Merchant Navy and other maritime organisations, is holding a series of events across the UK during May 2013. The main focus of activity will be in Liverpool, although there will be a number of events elsewhere, including London and Londonderry. For more information on what is being planned and how to join the commemorations please click here to download a copy of the inaugural Battle of Atlantic Newsletter. For further information and links to other Battle of the Atlantic related websites, please go to the official Battle of the Atlantic website www.royalnavy.mod.uk/Battle-of-the-Atlantic.